AISBackup: CD and DVD Options. Using AISCloseWindows to closedown the PC after a backup has been completed. From version 2.2 AISBackup has a built in ability to close down the PC or hibernate after a backup. 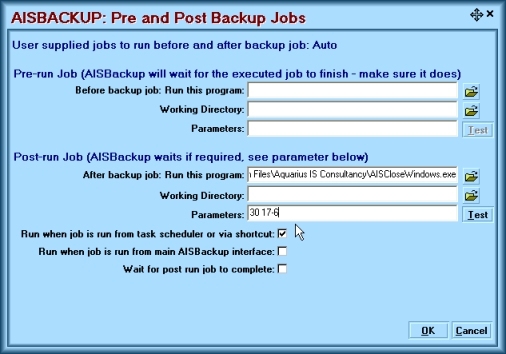 AISBackup has no built in support for automatically closing down the PC after a backup finishes, however, the post run job may be used to perform this function. Delay before closedown, so that the option may be cancelled if the PC is still in-use. Close down time period, to specify a time window for when the close down program should be enabled. Outside of the time window AISCloseWindows does nothing. Scenario: AISBackup should close down the PC but only if the backup is auto-running between the hours of 17:00 and 06:59 am. A 30 second delay should be added, just in case the PC is been worked on at the time. Extract the file AISCloseWindows from the zip file and copy to the AISBackup program folder. Select the job from the drop-down combo box. Choose the menu option: Manage Backup / Edit Backup Job Parameters. Click the button: Pre and Post Jobs. Use the After Backup job: Run This Program browse button to locate AISCloseWindows program. where: = 1 space, the hyphen must be present between the hour parameters. Check the option Run when job is run from Task Scheduler or via shortcut. To close the PC down after running AISBackup interactively (main interface) check the Run hen job is run from main AISBackup interface. Click OK t save the changes. To download AISCloseWindows click here.